Starting with the design first, the phone features a nice bar touch form factor with curved edges at the corners. Built of lightweight materials, the device only weighs around 178 gm. It has a dimension of 152 x 76.8 x 8.55 mm and sports a 5.5 inch long screen with full HD resolution. 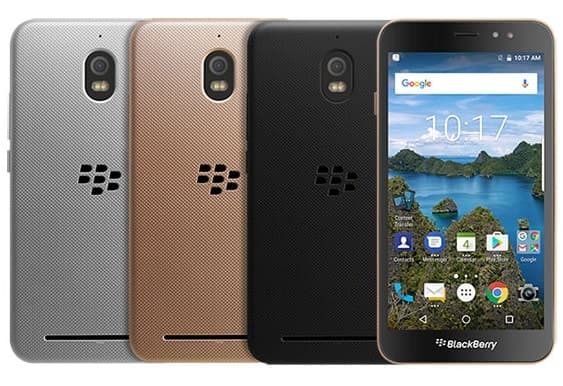 Available in three color variants namely – Gold, Silver and Black, all of them provide the same BB vibe and feel good in hands. The phone comes with a Qualcomm Snapdragon 425 MSM8917 chipset that beats at 1.25 GHz clock speed. Supported by a 4 GB RAM and a 32 GB ROM, the device can support further extension up to 256 GB on micro SD. Connectivity options are also pretty good as it features Wi-Fi 802.11 b/g /n Wi-Fi Direct, USB v2.0 tethering, Bluetooth 4.0, GPS, etc. The inclusion of the dual micro SIM support is the major feature that comes with this smartphone. It runs on Android Nougat 7.0 and is powered by a 3000 mAh Li-ion battery which supports micro USB charging facility. Camera wise, the phone has a 13 MP primary camera with CMOS sensor and phase detection autofocus feature. It is further supported by a dual tone flash that enhances low light photography experience. An 8 MP front facing camera with normal LED flash is also present that enables the device to click selfies. Because of such great specs, the device further supports full HD 1080 p video recording with hardly any lag in between. Hence, technically speaking, the smartphone hosts a decent hardware at an effective price. Though the processor seems pretty mediocre, it is enough to support the other specs of the device. One can avail additional offers by buying this phone from e-commerce sites like dinomarket, and can grab cashbacks and JBL speakers free of cost.